Chofu is a suburb west of Tokyo. The main attraction in Chofu is the Jindaiji Temple and botanical gardens. Jindaiji Temple is the second oldest temple in Tokyo, after Sensoji in Asakusa. While built in 733, the temple’s well-preserved grounds and historic architecture allows visitors to experience what Japan’s feudal past looked like. The temple served as a place of prayer for people from all walks of life, from peasants and merchants to samurais. Jindai botanical garden is just above Jindaiji Temple and extends 425,433 square meters. The garden is home to 100,000 trees and shrubs, as well as an assortment of flowers. This park has a protection program for endangered Japanese species and holds garden-related actives and exhibitions for local citizens. As you tour the temple and gardens, take a refreshing break and drink amazake, a sweet drink made from fermented rice. 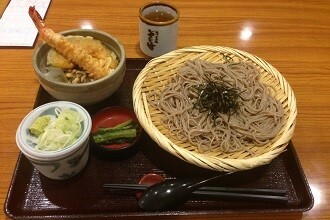 If you worked up an appetite, the temple is famous for its original soba noodle Jindaiji Soba. Dating back to the Edo era, the abundantly growing buckwheat and fresh water make for perfect ingredients for the Jindaiji Soba!